oluntary education professionals understand that the higher education environment is continually changing. Therefore, it is crucial to ensure that military students have the right tools available to help them make informed decisions as they begin a college degree or continue on to a graduate or Master’s degree. To help service members take the next step towards entering college, DANTES offers four different College Admission Exams for undergraduate and graduate degrees: SAT, ACT, GRE, and GMAT. •	Program Overview: provides a brief description of both the ACT and SAT exam programs offered to help service members meet admission requirements for a college or univerisity, a military-sponsored academy, and/or officer accession program. •	Student Benefits: highlights how college admission exams can help service members with their education and career goals. •	Program Eligibility: explains who is eligible to take college admission exams and have them funded and/or reimbursed by DANTES. •	Cost & Reimbursement of Test Fees: explains who is eligible for funding or reimbursement, and provides guidance on the test fee reimbursement process. One funded ACT is provided per lifetime of service for eligible service members. Funding is provided by a contract agreement between DANTES and ACT at the time of testing. No money is exchanged. The ACT Writing exam is not available at DANTES Test Sites. ACT retests at DANTES Test Sites are not funded. Military members are responsible for paying the test fee for retesting. Visit http://www.act.org/content/act/en/ products-and-services/the-act/scores. html for information about receiving and sending scores. 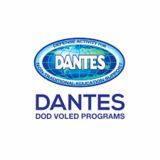 Scores for all ACT exams taken by Army, Navy, Marine Corps, and Coast Guard members at DANTES test sites are automatically reported to their Joint Services Transcript (JST). Scores for Air Force members are also made available to the Air Force Automated Education Management System (AFAEMS). One SAT with Essay is funded per lifetime of service for eligible service members. The SAT with Essay is available and required at DANTES Test Sites. Funding is provided by a contract agreement between DANTES and the College Board. SAT retests at DANTES Test Sites are not funded. Military members are responsible for paying the test fee for retesting. All exam reimbursement requests must be submitted via the Electronic Reimbursement Request. Contact the Exams Program via email at exams@navy. mil if you have questions regarding the electronic reimbursement submission process. Check out http://www.dantes.doded. National Test site reimbursement information. The GRE General and GRE Subject Tests to help service members meet entrance requirements for graduate school and/or military-specific programs. The GMAT to help service members meet entrance requirements for graduate school and/or military-specific programs. http://www.act.org/content/act/en/products-and-services/the-act-non-us.html - Although, the ACT test is the same everywhere, instructions for registration, test day, and score access vary by country. Service members living outside of the United States should review this page. ACT Social Media: http://www.act.org/content/ act/en/social-media-resources.html – offers quick and easy access to ACT information ACT Facebook: https://www.facebook.com/theacttest - provides timely tips and helpful information for students preparing for college SAT page: https://collegereadiness.collegeboard. org/sat - offers everything service member needs to know about taking the SAT SAT for the Military: https://pages.collegeboard. 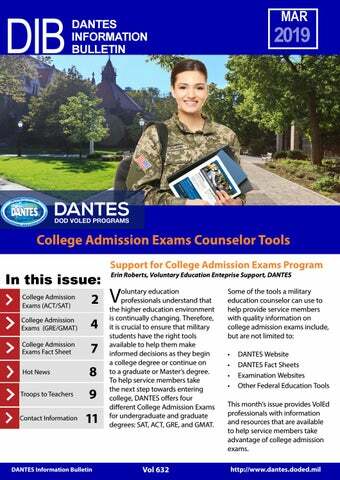 College Admission Exams Counselor Support Tools Downloadable fact sheets that summarize each program are available on the DANTES website, under the ‘Counselor & School Reps’ tab and within the ‘Program Materials’ section. Information includes a program overview, student benefits, counselor resources, and more. You can view, download, and print each fact sheet to use as easily accessible counseling tools. Share social media messaging this month highlighting College Admission Exams on your education center and base social media sites. Eligible military students can be reimbursed for the ACT, SAT, GRE, or GMAT college admission exams at www. myvoled.com. They can also get answers to questions and download the 2018 CLEP Official Study Guide on the College Board website at www.myvoled.com. hows military members what itâ&#x20AC;&#x2122;s like to be a participant in the Troops to Teachers (TTT) program. Check out the TTT website for the NEW Video section, https://www.proudtoserveagain.com/Resources/Videos. The lead video highlights retired Army Captain Heatherann Bozeman using her military skills to teach video production in her high school classroom. With the help of the TTT program, she was able to transition smoothly from one career into the other. will visit Joint Base McGuire-Dix-Lakehurst in March to discuss job opportunities, state certification requirements and program details, officials said. Jackson is one of about 1,800 New Jersey veterans the program helped between when it was started in 1993 through 2016. Shappell said Jackson and other teachers who are veterans help kids connect with military history or current events on a more personal level, they can also share perspective and life experiences, according to Shappell. “Not only is he very knowledgeable in his content, but he also understands the importance of being a good role model for kids,” Shappell said of Jackson. The teacher said that’s exactly why he was inspired to teach sixth-graders; he wants to offer support and perspective to kids during a confusing part of adolescence, and to be a positive role model for young men in particular. Troops To Teachers Jackson first began teaching as a substitute near McGuire Air Force Base, now joint base, when he realized through his school-aged son’s experience how few men were teaching at elementary and middle-grade levels. Jackson was still about a year and a half away from retirement when representatives from the national Troops to Teachers program visited the base to discuss how they could help veterans move into the classroom. Jackson quickly joined the program, which he said helped him branch out to substitute in Burlington City and Burlington Township schools, and to balance the demands of military retirement with those of teacher certification. He was certified to teach by the time he retired from service in June 2000, and shortly thereafter, he accepted a job teaching fourth- through sixth-grade science in Burlington City. Troops to Teachers training helped him apply his military experience, including the transient living, to the classroom. Jackson said each year he sees many students move in and out of Burlington City, and he always asks on the first day how many students understand the experience of frequent moves. Jackson said he is always excited to hear from students after they’ve left his classroom; during his year with them, they’re often just beginning to figure out who they are and what they want to do with their lives. “I really love what I do, and I try to make an impact and difference in their lives,” Jackson said. DANTES Information Bulletin The DANTES Information Bulletin is published monthly to inform education personnel about DANTES programs and to help promote more efficient customer service to service members. Email all inquiries to DANTES_Outreach@navy.mil. Reproduction in whole or in part is permitted for any purpose of the United States Government, except that copyrighted materials cannot be reproduced without written permission from the copyright owner. The appearance of external hyperlinks does not constitute endorsement by DANTES of the linked websites, or the information, products, or services contained therein.